The Arab village of Tabor near the base of Mount Tabor. Tabor is where Deborah fought with Barak in the Bible, and also where Jews hid against the Romans (unsuccessfully). Bell tower of the Eastern Orthodox monastery on top of Mount Tabor. 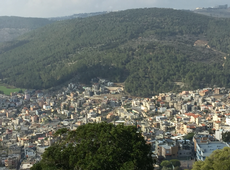 Our drive up Mount Tabor in Northern Israel turned out to be quite an adventure – especially since at the top of this scenic peak I got into the wrong rent-a-car. 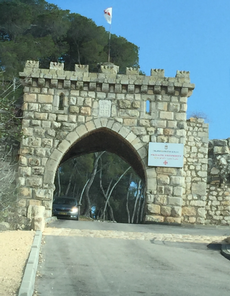 The approach to Mount Tabor, which is rich in Jewish history as well as New Testament history, is through an Arab village. My husband and I expected there to be big green signs in English directing us. But the site is not well marked and there were only Arabic street signs. We stopped at a gas station for directions on how to make our way through the maze of winding streets. 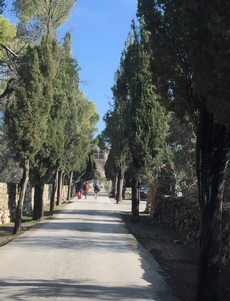 Christians believe Mount Tabor is the site of Jesus’s transfiguration. I must admit I had no idea what “transfiguration” meant, and I rather suspect that most Jews don’t. It means that this is where Jesus is believed to have dialogued with both the prophets Moses and Elijah. As for me, I didn’t dialogue with either Moses or Elijah. If they were there, I don’t know where they were hiding. So the only "figuration" I had was figuring out what transfiguration meant. 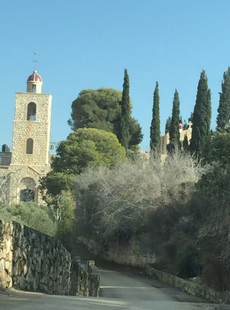 There are three beautiful churches at the top of the mountain, and the remains of a crusader fortress. While my husband was exploring one of the churches, I got out of our rent a car to walk over to a shaded area where some Arab youth were gathering around some picnic tables. We had a silver Eldan rent a car. On the way up we had purchased water bottles, and I had taken a couple of oranges. Our car was the last one in the first row of the parking lot. I got back into the car, ate an orange, drank some water from the water bottle, and splashed some water on my face ( some spilled onto the seat by accident). I then understood that when I had been wandering around, another silver Eldan rent a car had pulled up to park beside ours, and the passenger of that car had left his/her door open. I suddenly then realized I had drunk someone else’s water, eaten their orange, and spilled water in their car. My husband began removing the orange peel from the car. “What should we do?” he said. I don’t know what Jesus or Moses or Elijah would have done (although they would probably have said that we should have put one of our oranges in “our neighbour's” rent a car and replenished their water supply). I said “let’s get the heck out of here, before it gets really awkward and I am charged with breaking and entering and theft of an orange and water!” Needless to say, I personally did not experience any transfiguration. After that, I didn’t talk to anyone. But, the views on the way up and down Mount Tabor were jaw-dropping. Relatively near to the top of the mountain, there is a hiking trail made by the Jewish National Fund, and I understand that Bridges for Peace helped to re-forest Mount Tabor with pine trees (and the reforestation is marvelous). 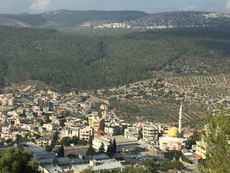 I have always wanted to drive to the top of Mount Tabor ever since I visited the small town of Um Qais in Northern Jordan, which overlooks the sea of Galilee. At night, all the way from Jordon, I could make out the shape of Mount Tabor in the distance. 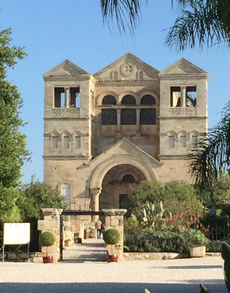 I recommend you go to Mount Tabor– but if you do, make sure to take lots of water and oranges, and lock the doors to your rent a car. You never know who might enter accidentally. P, s. There is an alternate site in the Golan which some Christians also believe is the site of Jesus’s transfiguration.